Fast food, meatless Monday & Jeff has ham. It was as delicious as I remember. I was also told that, when provided ham, you do not question as to how it was acquired. Ham has secrets too, I guess. Anyway, tonight was one of those nights where we didn’t have time to cook and our schedules (or was it poor planning?) relegated us to picking something up on the way home from the gym. “Fast food,” you may call it. Here in Kuwait, we call it deliciousness. 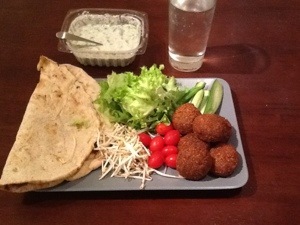 We bought the falafel, bread and cucumber-yogurt sauce. We had the rest laying around from salads and curries. Mix together and you’ve got our meatless Monday dinner. Yum!